This report involves further upgrades to my Rotel RCD965BX. Readers might like to refer back to the account of an earlier upgrade which is reported in here: Chevin Audio CD Player Tune-Up-Grade. In 2005-6 Mark Wheeler and I both had our CD Players upgraded for review purposes by Chevin Audio. Mine was a Rotel RCD965BX (not the Discrete model), which is a popular candidate for this kind of tweaking. As we reported at the time, I was happy with the improvement in sound, and I have continued to use it for general CD-playing duties. I must admit that these are light, as most of my listening is on vinyl. While that upgrade did make CDs more enjoyable to listen to, I still found that they lacked the crispness and musicality that I associate with vinyl. Crispness? Yes, I find that while digital sources can sound edgy, they usually lack the sharpness of definition that good vinyl playback offers. So, with this further upgrade I was hoping for a movement in that direction. NET Audio is a UK company which specialises in high quality clocks for CD players. I first heard of them through Georgio Pozzoli's very thorough and enthusiastic three-part TNT review entitled CD Player Clocks by NET Audio Georgio's review is quite technical, more so than I can manage, but I was interested in his conclusions. He found that all of NET Audio's clocks were better than his reference clocks and that the RockClock was the best of the three. So, when the manager and technical director of NET Audio, David Pritchard, offered to let me hear the latest version of the RockClock, I was interested to hear if it would enhance the sound of my already upgraded Rotel. Not being able to make technical measurements, I have tried to approach this simply, asking whether the latest version of this clock improves the sound sufficiently to enable to me to recommend this upgrade to owners of similar mid-priced players. Obviously this upgrade is dependant on the quality and performance of the rest of the player. It is a bit like upgrading your cartridge in vinyl--the motor unit and tonearm especially have to be of sufficiently good quality to do the better cartridge justice. Installation of the clocks looks pretty easy on his website, so initially we agreed that he would send me the parts for me to install. But, the prior mods by Chevin Audio made his directions a little difficult to follow. Not wishing to screw up the installation and possibly ruin what looked to be very fine components, I asked David to undertake the installation for me. I would stress that this is only because of the prior mods. If you are able to follow instructions and solder you should have no difficulty working on an unmodified Rotel. I assume this would be true of other players too. David advised that he should leave all these other mods in place and just change the clock and PSU to be sure that any change in sound could be attributed to this change only. This is helpful as it enables me to comment on the kind of change/improvement that could be expected from fitting this clock and PSU to other CD players. This is not a mod which is only available for Rotels! So, my Rotel went off to Cambridgeshire, where NET Audio is based, with the shipping bolts duly in place. I was not in a hurry for this installation, but David did the job quickly, and it arrived back safely. Curious to see what he had done, I quickly opened it up and was delighted to see how neatly and cleanly it had been done. This confirmed my impression that this would be a fairly simple upgrade job for someone with an unmodified player. The earlier Chevin Audio mods had gone further than just replacing clock and PSU. 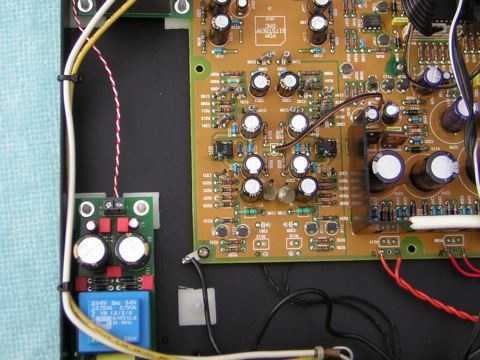 Electronically, they had added ten more power supply capacitors to reduce noise at audio frequencies, replaced the opamps (rebiased into class A) and replaced the audio output coax wiring with fine ptfe twisted silver plated copper wire. Mechanically, Chevin Audio had also damped the sides of the player and removed the rubber pads in the feet. The components used are pleasing to look at--particularly the PSU. Combined with David's neat workmanship, it is a pity that the mod has to be concealed inside the case. Maybe someone should come up with a transparent case? Or, adventurous DIY-ers could consider mounting the PSU and Clock (in a nicely sprayed cover!) on top of their CDPs. Just joking--there is plenty of room in most CD players to mount the clock beside the main board, and to tuck the PSU nicely out of the way. The overall location of the two components in the Rotel can be seen below, looking at the CDP from the front. Those interested in doing the installation themselves should refer to the guidance pages. Note that these pages give upgrade instructions both for the RCD965BX and the RCD-965BX Discrete. The term 'discrete' (meaning 'separate'--not 'discreet' meaning 'tactful') refers to the separate transistor output stage which was fitted to this top of the line model. 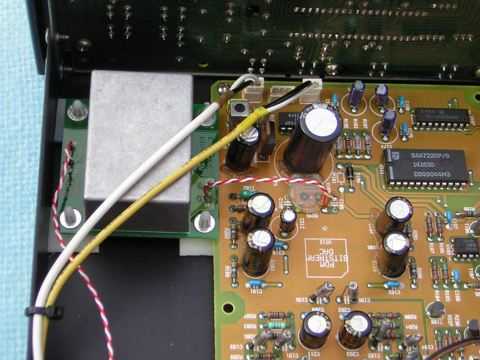 As the netaudio website says, that upgrade cannot affect the quality of the sound from the DAC itself. This is where the RockClock (or ROKCLOK, as the board itself is named) comes in. Evaluating a component upgrade like this is inevitably subjective. Home listening tests never take place in isolation, nor in controlled conditions. These tests were done with two different systems which are themselves both under development (listed below). System A was the main system used for evaluation. 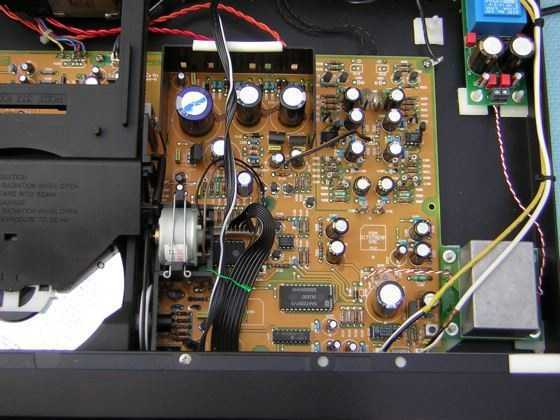 In this system, although the CDP is wall-mounted, it has preamp and phono preamp stacked on top of it because of space limits. I have all the parts for building a FleXy table, but this review has been waiting for a while, so the FleXy has to wait. Therefore in System A the CD player is not ideally isolated or damped. In System B, the CDP sat on a separate wall-mounted shelf below the amplifier. But it is in a different room, where the corner of a TV partially obstructs the sound waves from one of the speakers. Welcome to the real world folks. I am lucky to be allowed to run a test system in the sitting room, but speaker placements is determined by lifestyle, not optimal sound. Okay, okay, enough about the furnishings, what about the sound? I'm glad to say, it's good. It's not different in character, just more accurate. I don't enjoy the sound of CDs because so often they give a sharply defined, edgy, general impression of the music. If you have reasonably accurate amplification and speakers, as I have, then then all they do is offer you this general impression of the music very accurately. See the problem? Most midrange CD players lack the accuracy that makes recorded sound feel real. What this clock upgrade does for me is to bring the music more into focus. I know that this sounds both general and subjective. Here is the test I use: I put on a well-recorded CD and then do some light reading. If the music sounds right, then I relax and am able to give my full attention to what I am doing. If it doesn't, at a certain point my attention is dragged back to the music system to fix whatever is wrong. With the RockClock, time after time, I have let the CD run to the end without any impulse to stop it. And when it has stopped, I have sometimes got up and gone to my turntable to flip the LP to the other side, only to smile as I realise that wasn't vinyl after all, but still sounded pretty good. This is an upgrade that I would recommend to owners of good quality mid-range CD players. If you like the sound already, this upgrade with bring your music more clearly into focus. A word of warning to Rotel RCD965BX owners: check that your CD transport is still okay. Mine sticks a lot, a known weakness of these decks. If you plan a quality upgrade like this, make sure the rest of your deck is in good condition as it could remove the itch to upgrade for quite a while.